Our S14 Billet Camshaft and Distributor Covers are just the ticket for the S14 equipped with standalone engine management. Precision machining offers both aesthetic and functional benefit, these covers eliminate the factory cast cover or distributor when they are no longer needed and leave a clean and tidy engine bay that keeps oil in and debris out. A great addition to our KMS or MoTec ECU kits, but works perfect with all others too. 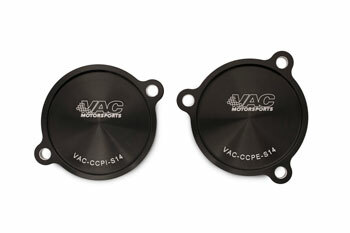 VAC Motorsports billet BMW components: Second to none!